Home health services are given by a variety of skilled health care professionals in the privacy and comfort of a patient’s home. Home Health care provides skilled nursing care, physical, occupational, and speech therapy services as well as medical social services and home health aides. The need for home health has grown. Treatment that was once only done in a hospital can now be done at home and is usually less expensive and can be as effective as care in a hospital or skilled nursing facility. The home health staff provides the care your doctor prescribes and creates a written plan of care to meet your needs. The home health staff keeps your doctor up-to-date on how you are doing and updates your plan of care as needed, as authorized by your doctor. The goal of short-term home health care is to provide treatment for illness or injury. It helps you get better, regain your independence, and become as self-sufficient as possible. The goal of long-term home health care is to maintain your highest level of ability or health and help you learn to live with your illness or disability. 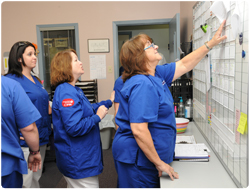 Nursing staff preparing weekly schedules.